Any mom who has been in labor knows there is natural pain expected. 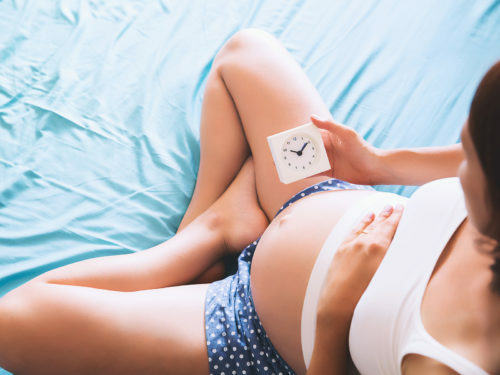 In preparing for the big day, expectant moms can consider all the ways they can help soothe pain, whether that looks like a birthing ball or an epidural. Once they weigh the options and consider what works best for them, moms can then describe their preferences in the St. Luke’s Birth Plan. Every pregnancy, labor and delivery is unique — which is why offering options is so important. Moms are encouraged to do what’s right for them once they’re in labor, whether that’s following the birth plan step-by-step or just coming in and going with the flow. Either way works! It’s all about you! At St. Luke’s Birthing Center, moms can choose from a range of low-intervention options that include breathing techniques, labor tubs and massage. For moms seeking more assistance to control pain, St. Luke’s offers a list of pharmacological (medication-related) pain relief options. Here are a few options to consider. One of the more popular non-invasive options is Nitrous Oxide. Administered through a mask, Nitrous gives moms 100% control of how much or how little they take. Because of how quickly Nitrous enters and leaves the system, this is considered a lower intervention option of medicated pain relief. The pros of IV pain medications? It’s fast-acting. The cons? It’s short-lived. For moms seeking immediate relief, this could be an option for them. They may feel a little drowsy or sleepy, but the relief will only last about 45 minutes. This option is intended for the early stages of labor, often to help with contractions. It’s a great choice for moms in prolonged labor who want a bout of relaxing relief. Intrathecal analgesia refers to a single injection of pain-controlling medication into the spine. Unlike an epidural, an intrathecal provides temporary relief through a one-time injection to help moms stay comfortable until delivery. Because it’s injected only once, it’s possible that the intrathecal relief could end before delivery. An epidural, while still administered through an injection in the spine, offers ongoing pain relief. Medication can be given in a continuous manner up until delivery. It does not have a finite end like an intrathecal. Similar to an epidural, this option provides pain relief through an injection. This option numbs the lower half of a mom’s body during a c-section but allows her to stay awake during delivery. A less common route for c-sections is general anesthesia. If the epidural isn’t working, or if mom or baby’s health is a concern, a c-section would happen under general anesthesia. In this case, mom is not awake to see, hear or feel anything during birth. No matter what route labor and delivery takes, the St. Luke’s team is here to support moms and babies. Birth plans can change and decisions can be made to accommodate the labor and delivery that moms want, while still keeping mom’s and baby’s health a priority. St. Luke’s Birthing Center is located in Duluth, MN, with St. Luke’s clinics in the surrounding region, including Superior, WI. To schedule a tour of St. Luke’s Birthing Center, call 218.249.5605.